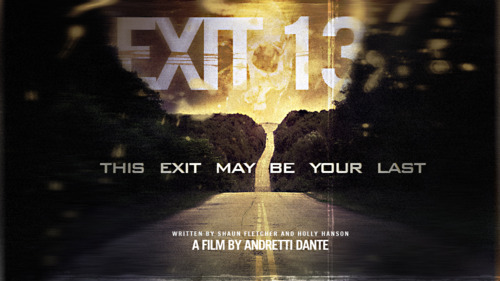 From the mind of Andretti Dante, the man that brought us Book of 1000 Deaths, comes Exit 13. In this chilling, psychological horror, five friends embark on a road trip but something goes terribly wrong, setting off a series of terrifying events that forces them to Exit 13, an exit that’s hauntingly familiar. Soon after, an unforeseen event occurs trapping the group inside an abandoned cabin. But this isn’t just any cabin, and it seems the dark and evil past has been re-opened. With the recent passing of his mother and desertion of his father, Adam Payson is drifting into a dark and dangerous place, isolating himself from the one who loves him most, his girlfriend Madison. Unable to get through to him, she turns to Adam’s best friend Brandon for help. For more information about this upcoming road trip horror, you can visit exit13movie.com or follow them twitter. You can also catch up with them on Facebook or Myspace. If you are interested in supporting Exit 13 you can do so by visiting the Kickstarter page.